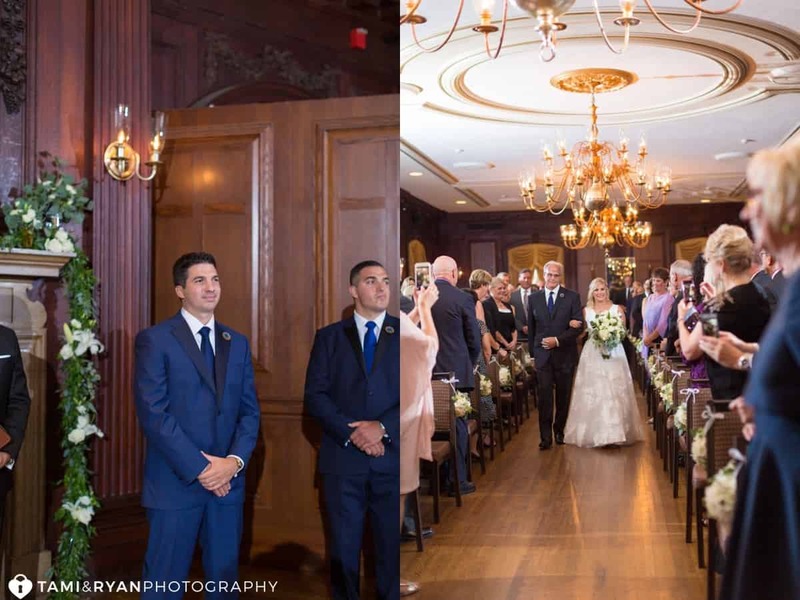 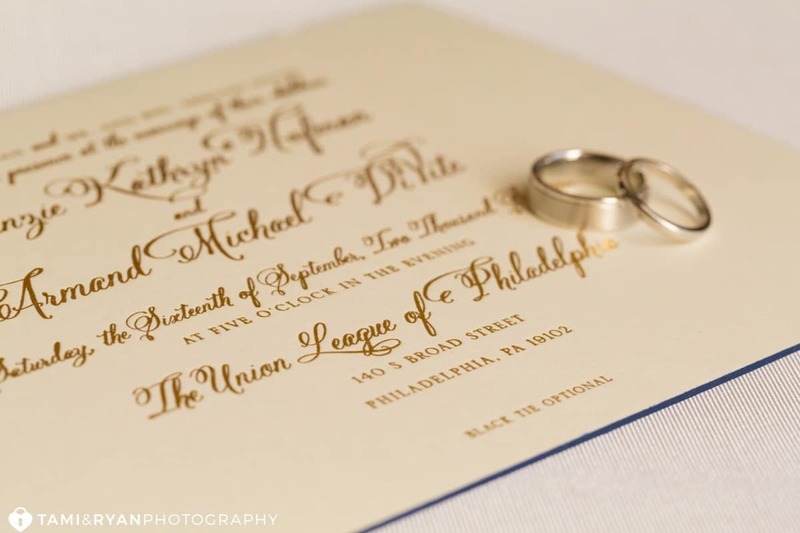 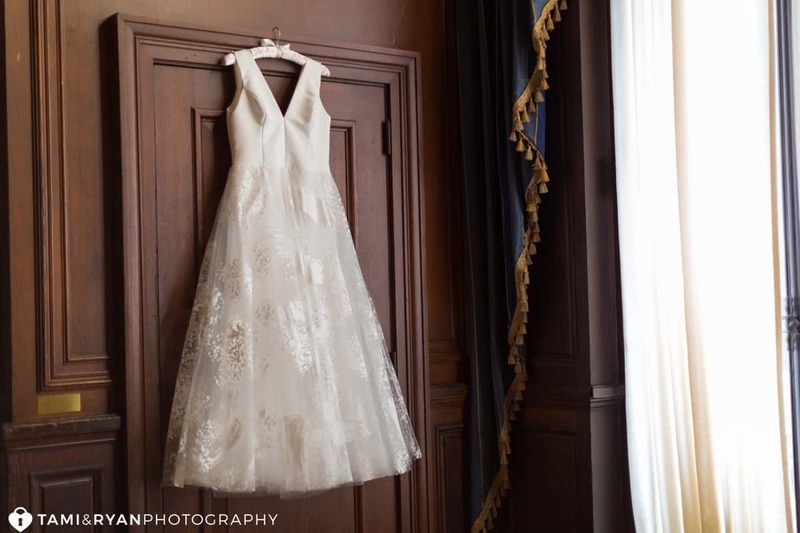 Mackenzie and Armand’s fall wedding at the Unique League of Philadelphia was truly one-of-a-kind with a classic style that incorporated unique and stylish details along the way. 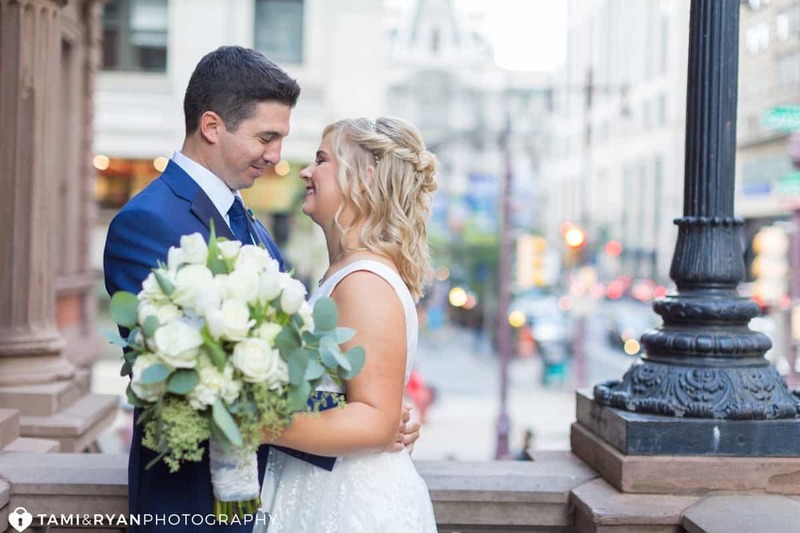 We already knew they were a pleasure to work with from their engagement session and loved getting to know their friends and family throughout the wedding day. 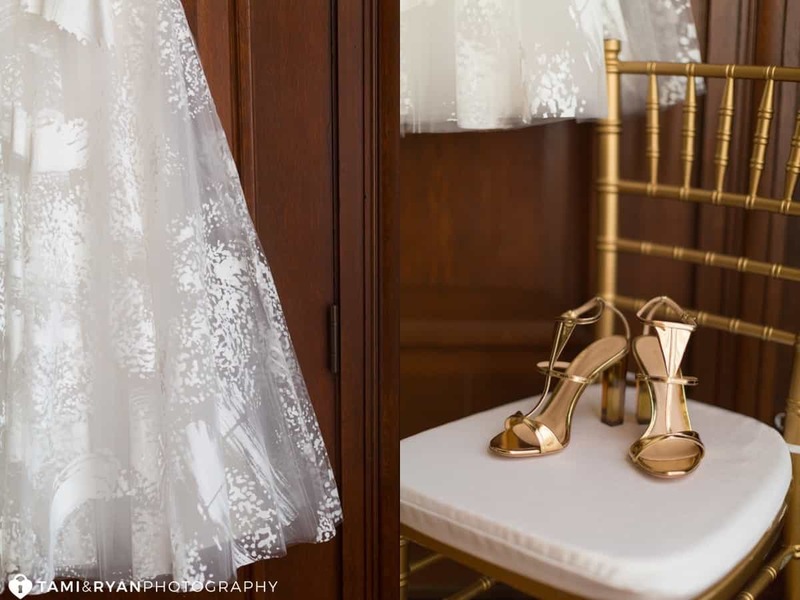 The couple’s unforgettable wedding day was stylish, sentimental, and gorgeous, just like the bride and groom! 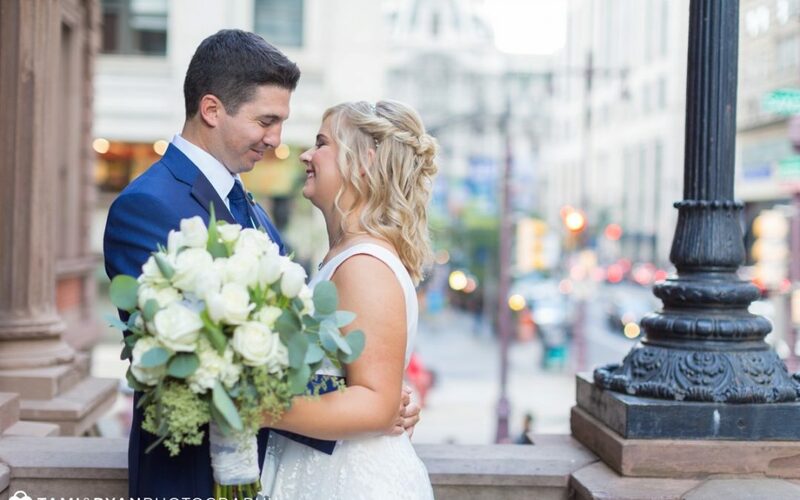 The bridal gown was custom designed by Kate McDonald Bridal as a modern take on the traditional a-line ball gown, which Mackenzie looked gorgeous and elegant in, of course. 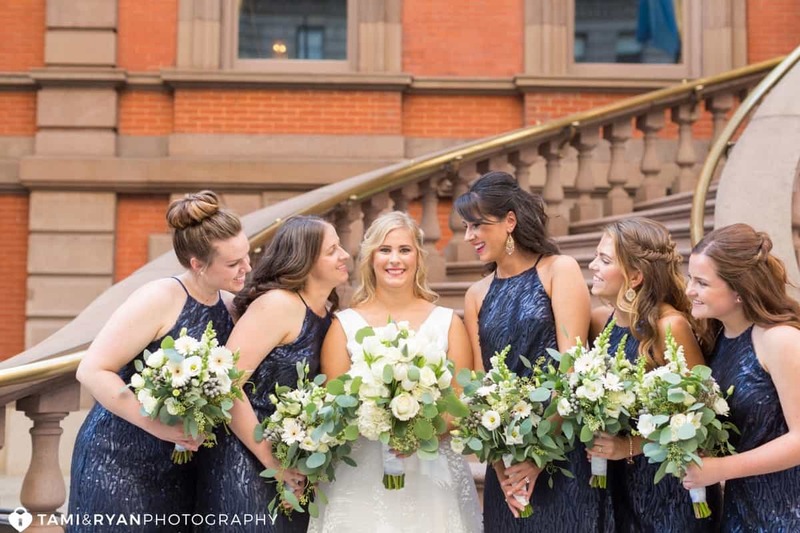 The bridesmaids dresses came from BHLDN, Anthropologie’s bridal line, and they looked absolutely beautiful. 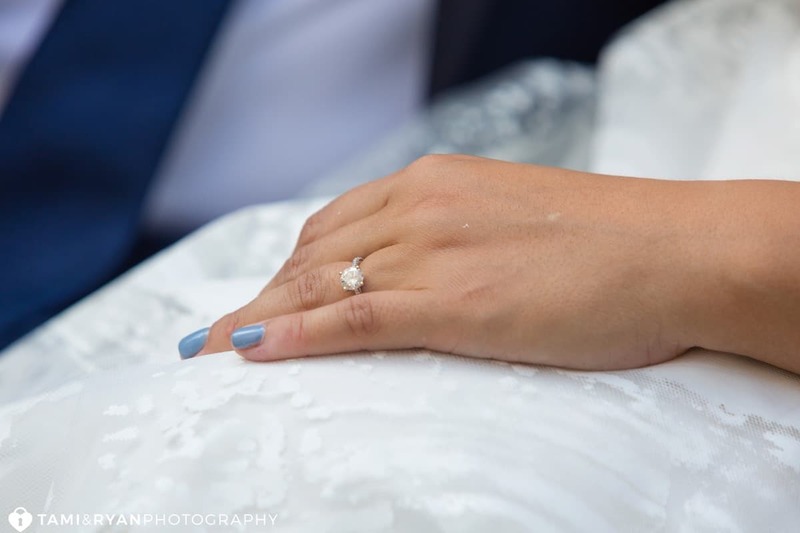 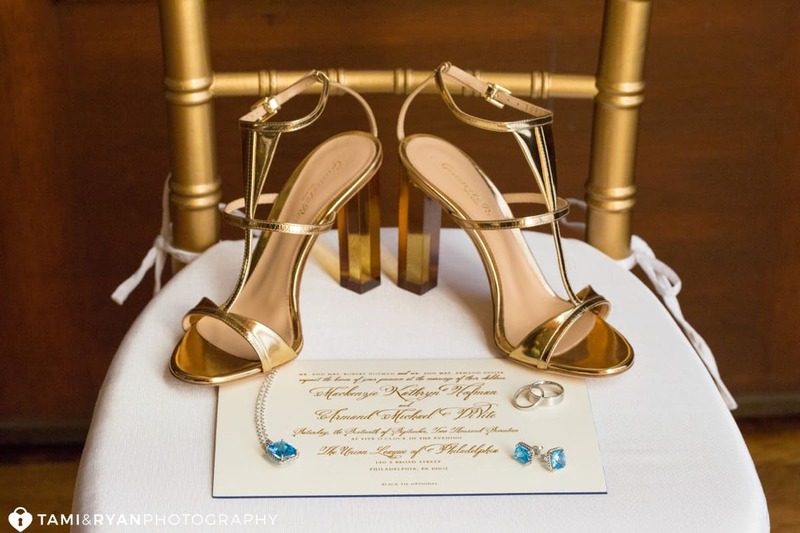 The stunning bridal jewelry made by DeFino & Campagna Fine Jewelry that gave her a pop of blue, was gifted by her parents for her college graduation. 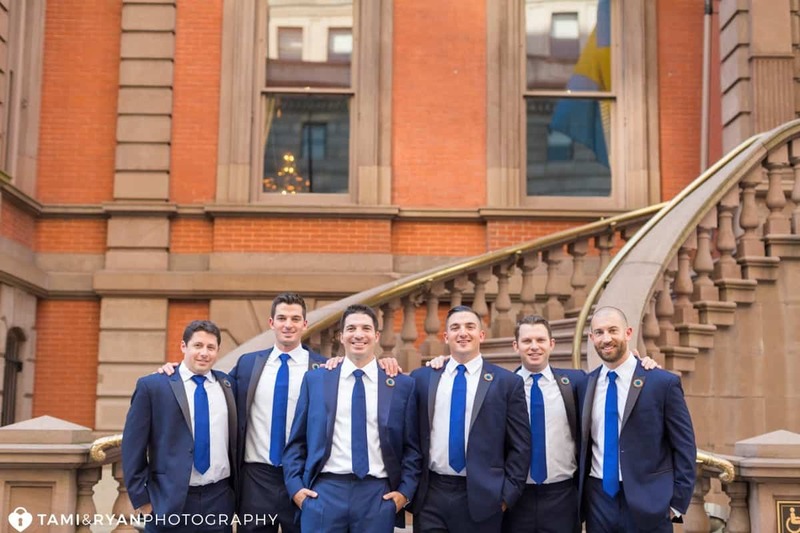 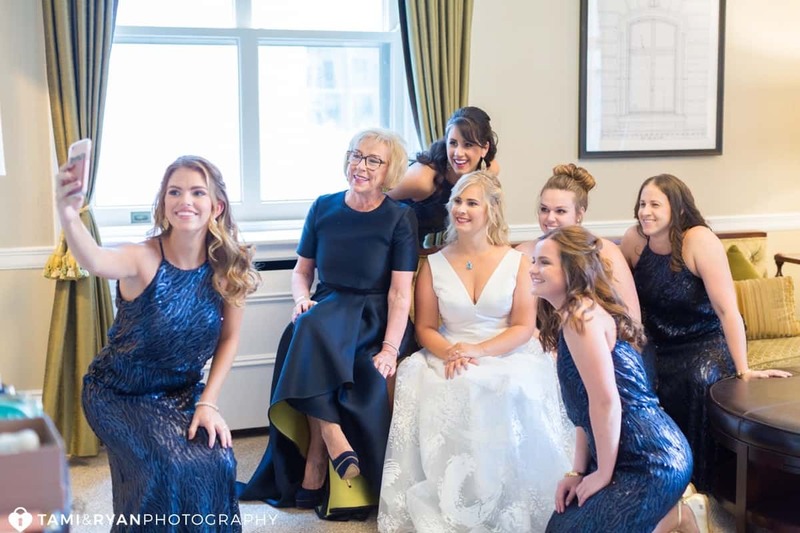 Mackenzie and her bridesmaids had a great time getting ready at The Inn at the Union League! 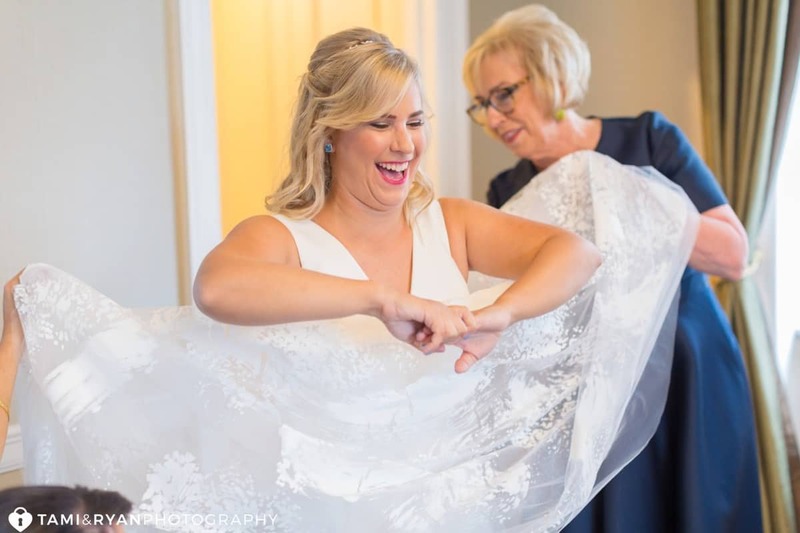 You could tell this was an important time for her and her mom, especially when the gown was finally on, hence her moms excited reaction. 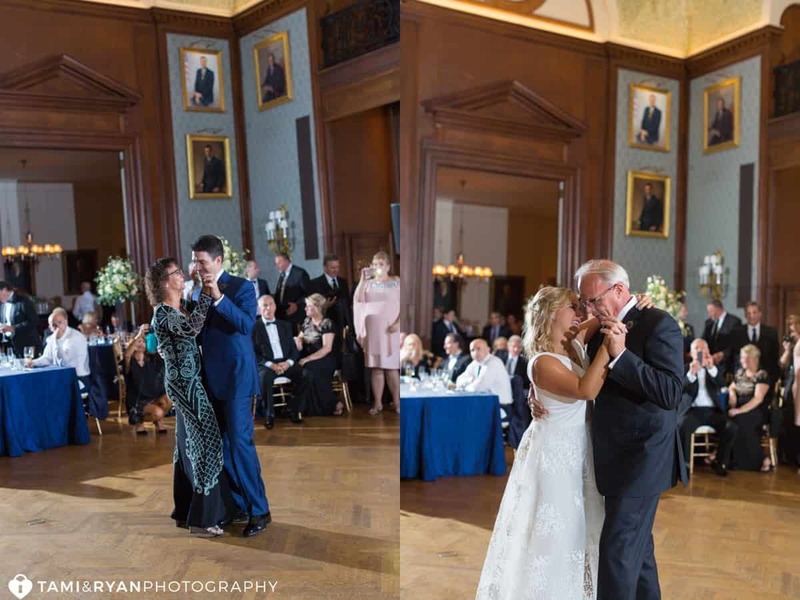 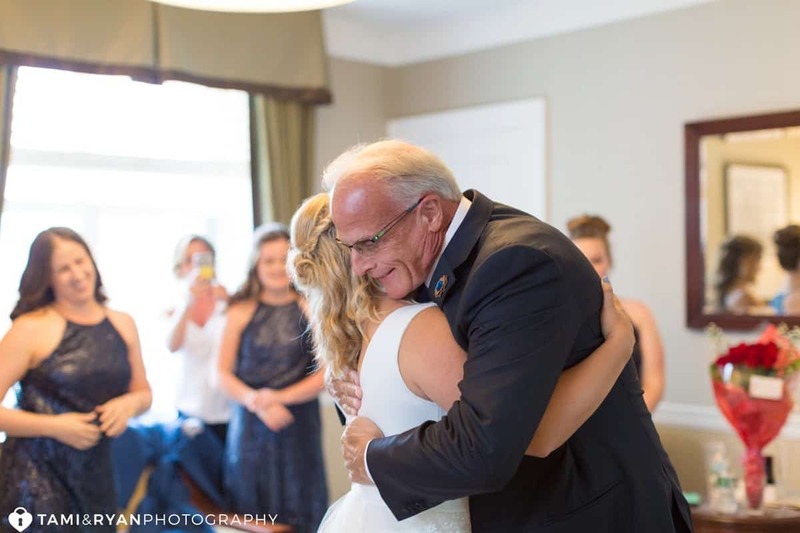 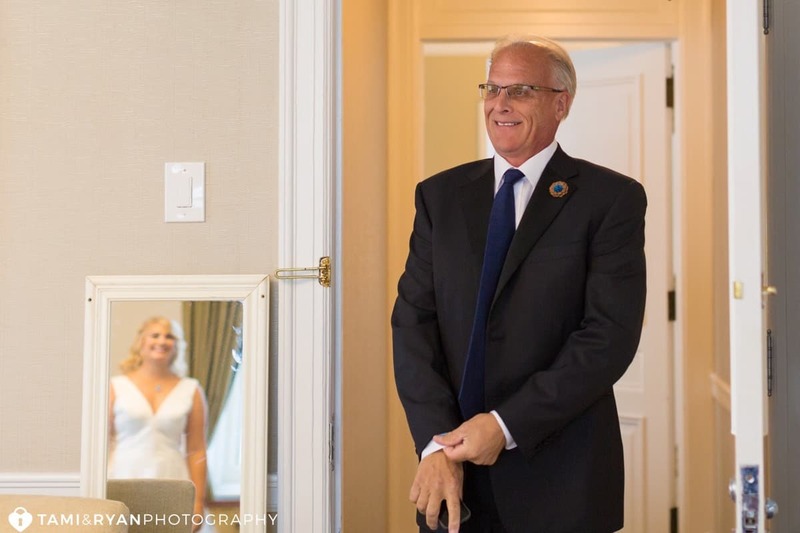 Such a sweet moment between the bride and her father for their First Look! 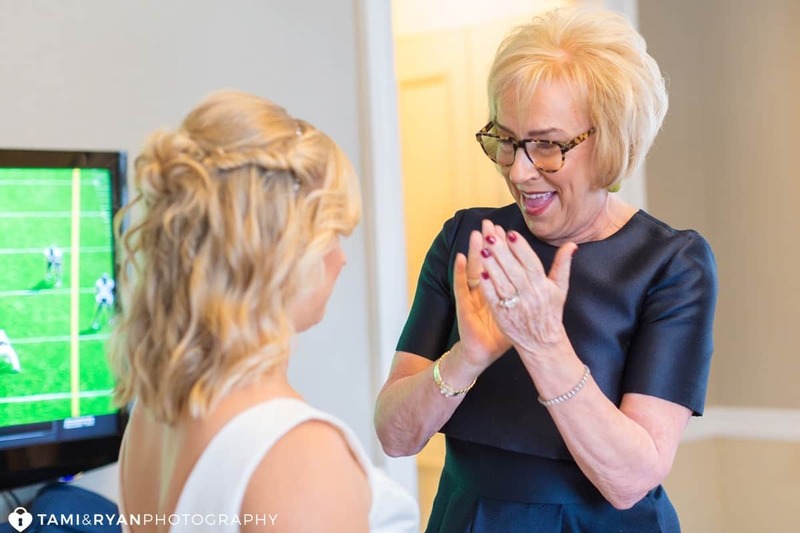 Mackenzie’s junior bridesmaid, Abigail, kept a longtime family tradition going! 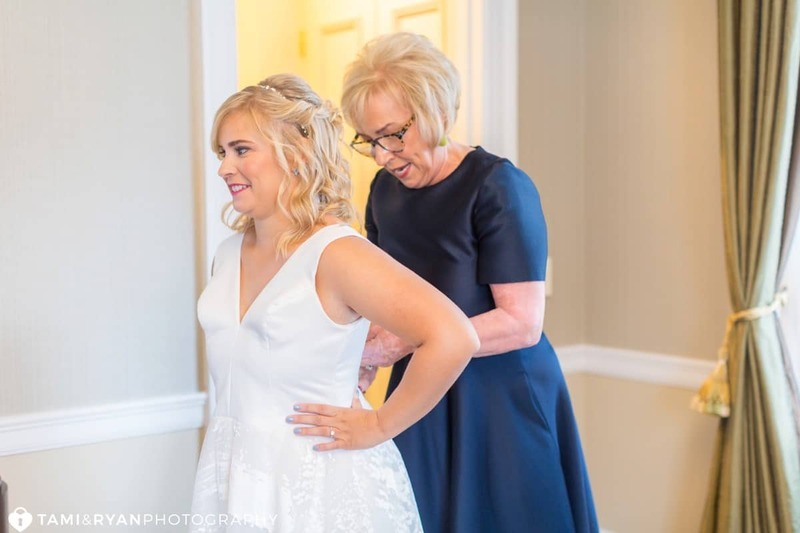 Abigail’s mother was a flower girl at Mackenzie’s mother’s wedding, and when Abigail’s mother married, Mackenzie was her flower girl. 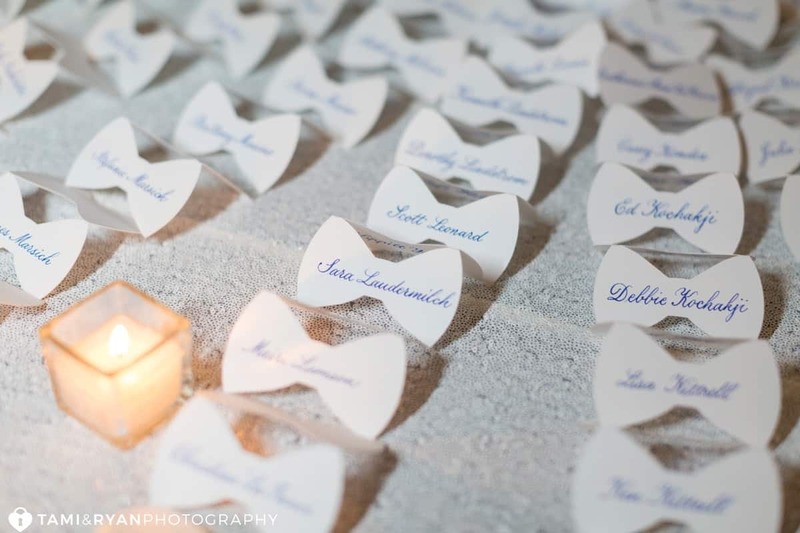 What a great way to involve your family and keep up a family tradition! 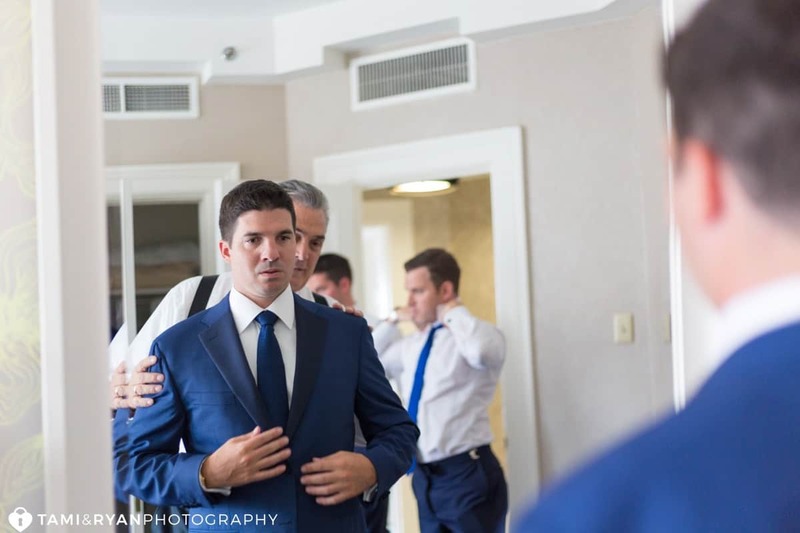 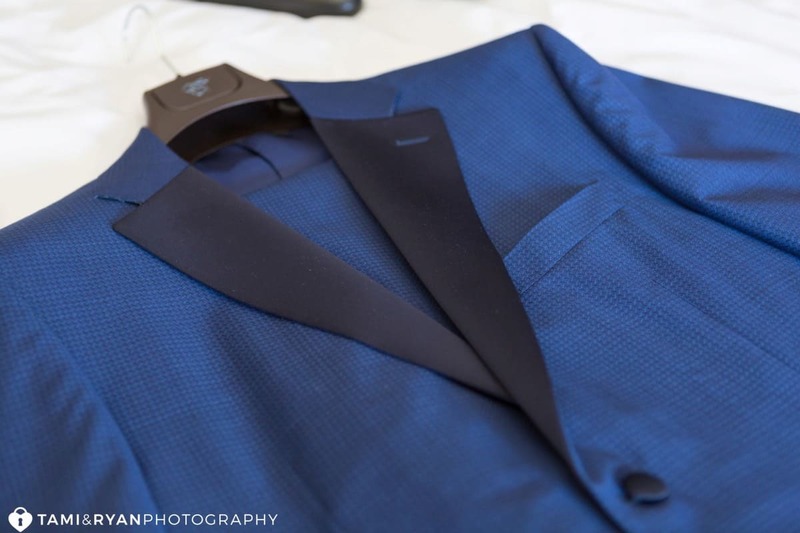 Armand was so stylish in his vibrant blue suit, custom designed by Canali! 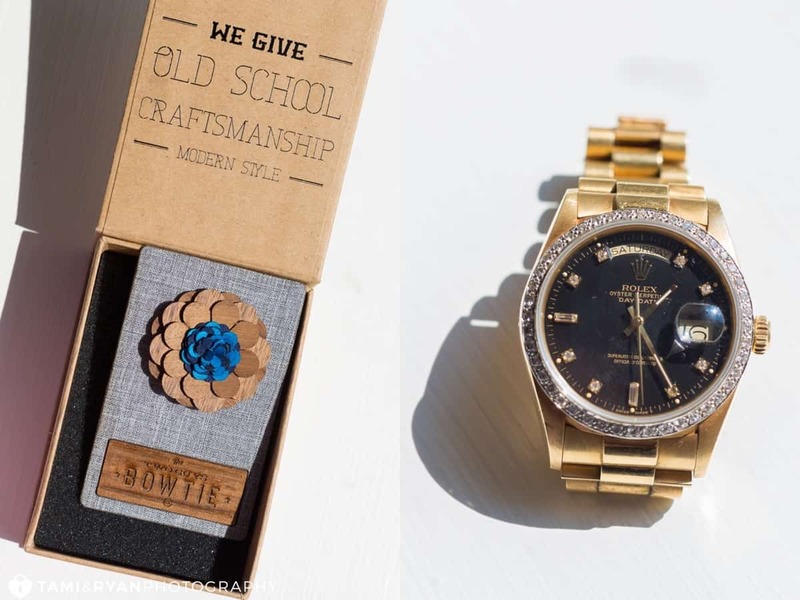 His boutonniere was genuinely unique, a modern, handcrafted wooden piece and his Rolex added to his modern groom style. 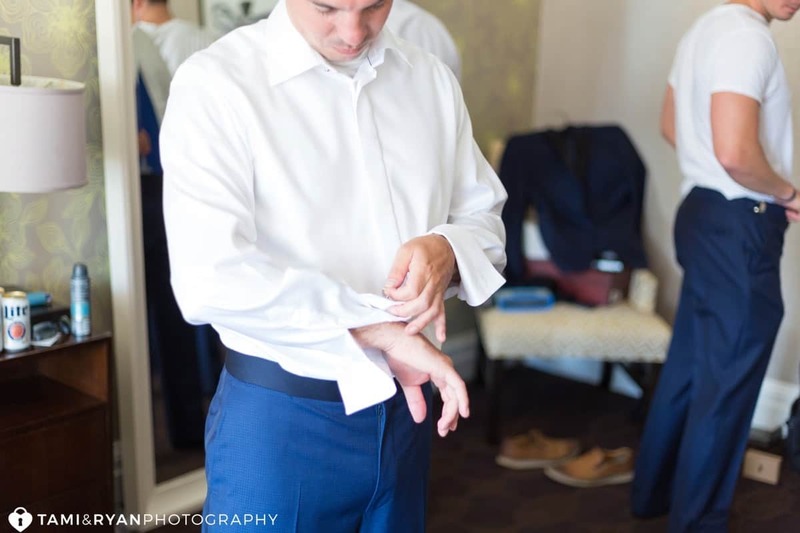 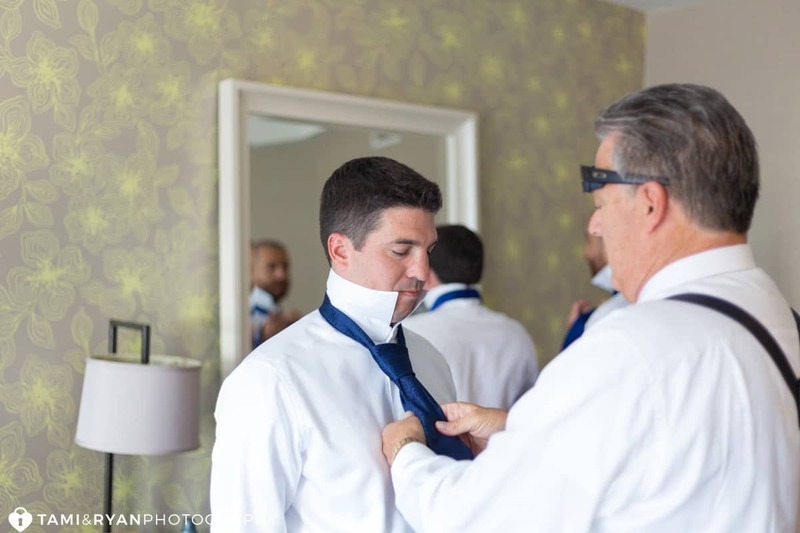 While the ladies were getting pampered, Armand and his groomsmen enjoyed a little free time before making final touches on their dashing looks at the Hyatt at the Bellevue. 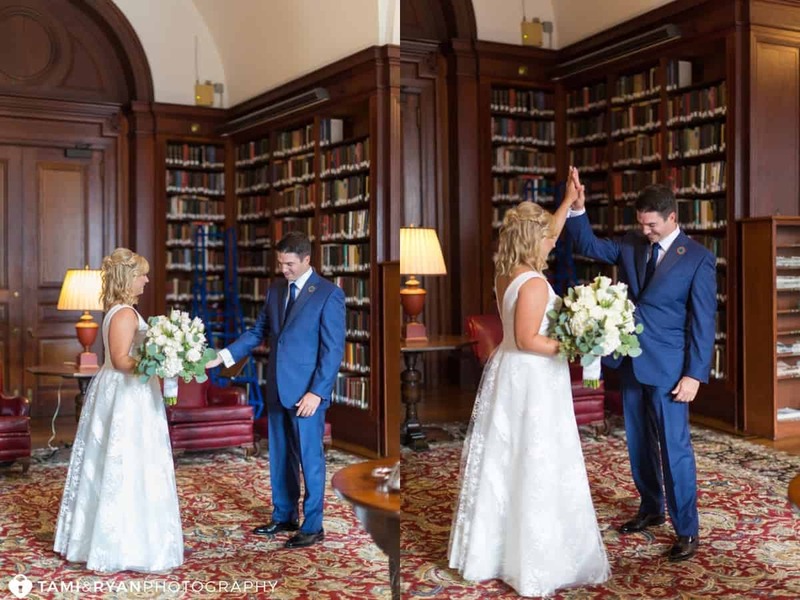 “We met at University of Rhode Island through mutual friends. 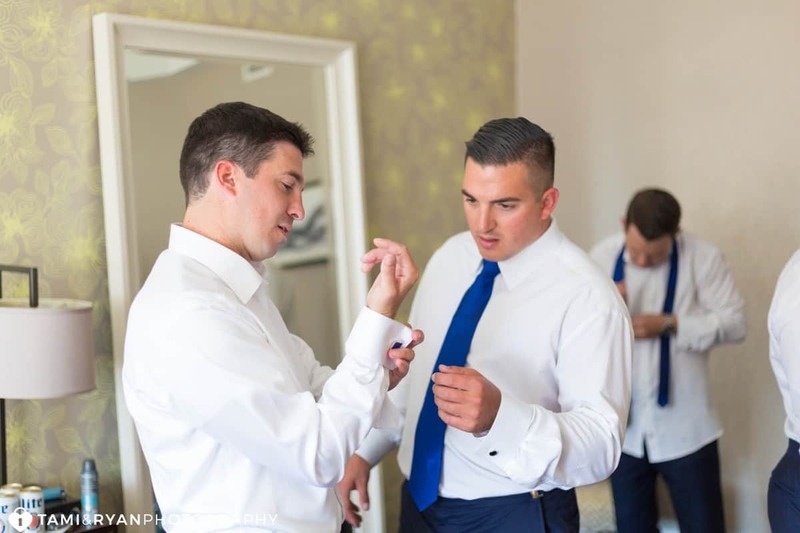 Two of Mackenzie’s friends through a campus group called The Student Alumni Association happen to be Armand’s roommates and they introduced us! 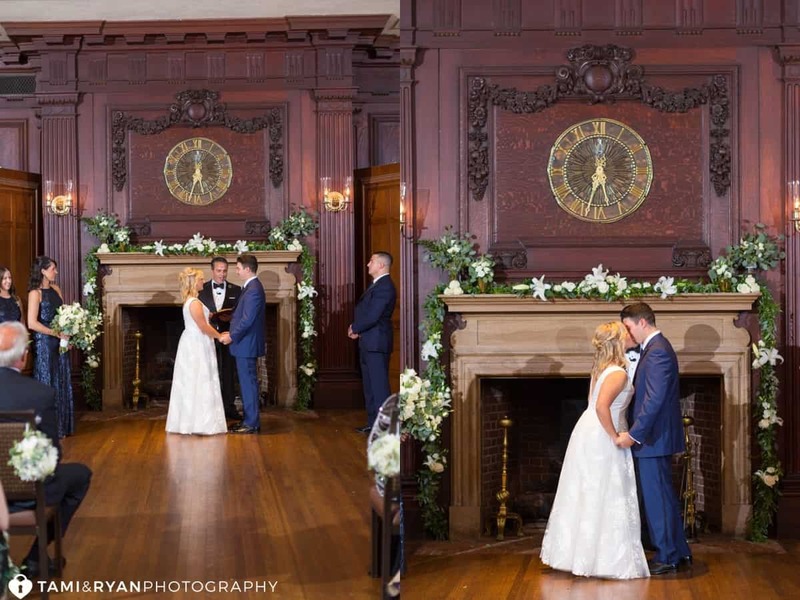 The moment Mackenzie and Armand laid eyes on each other for the first time on their wedding day was so sweet and perfect! 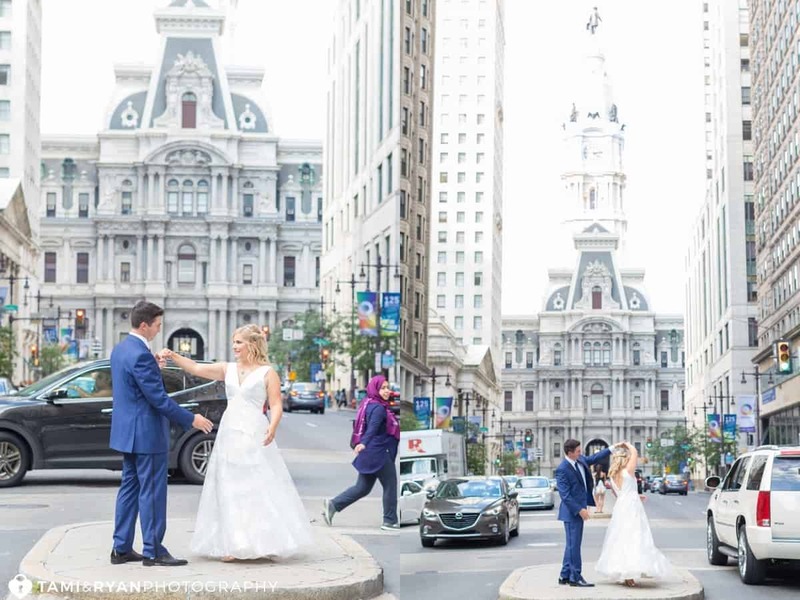 They loved having that special time together before the excitement of the day took off. 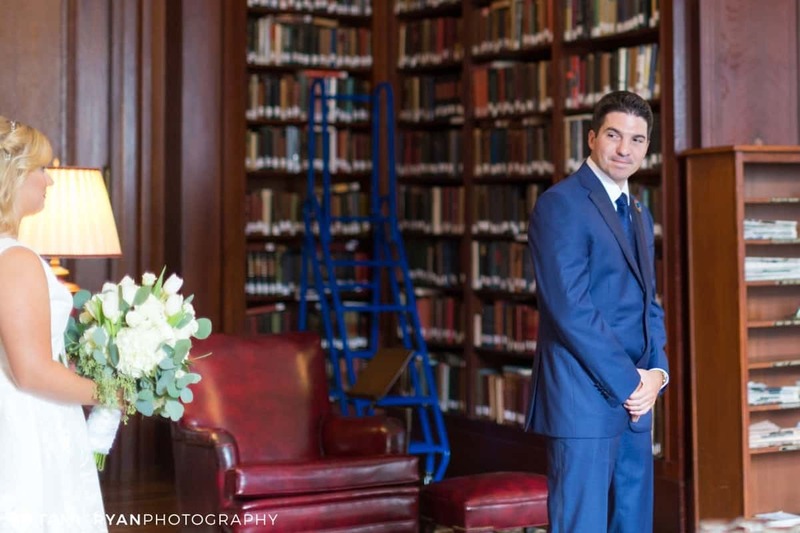 We wanted to take advantage of the rare time with just the two of them, so we photographed the pair inside the library of the Union League. 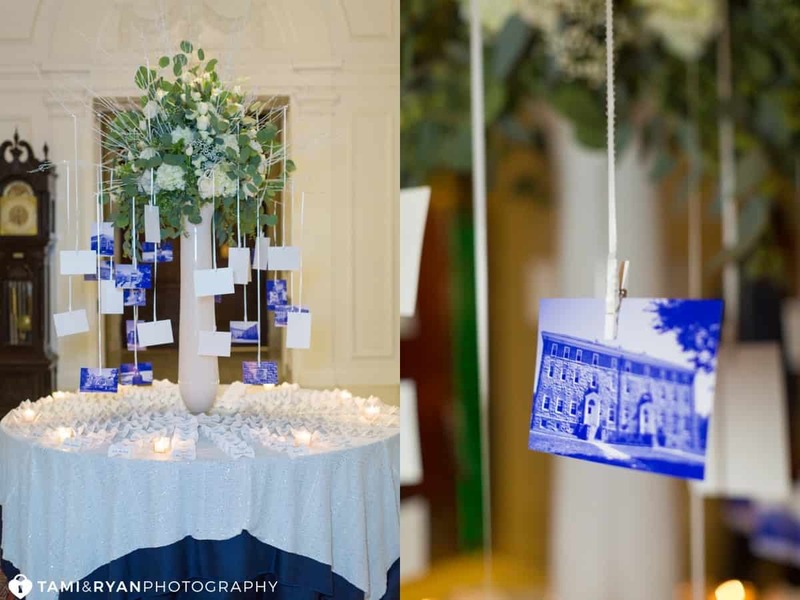 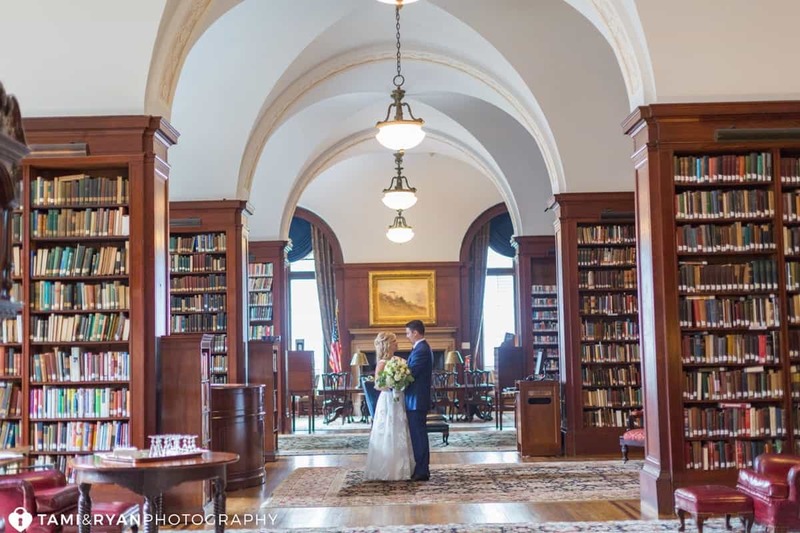 The library ended up being the perfect intimate setting for romantic portraits of the bride and groom! 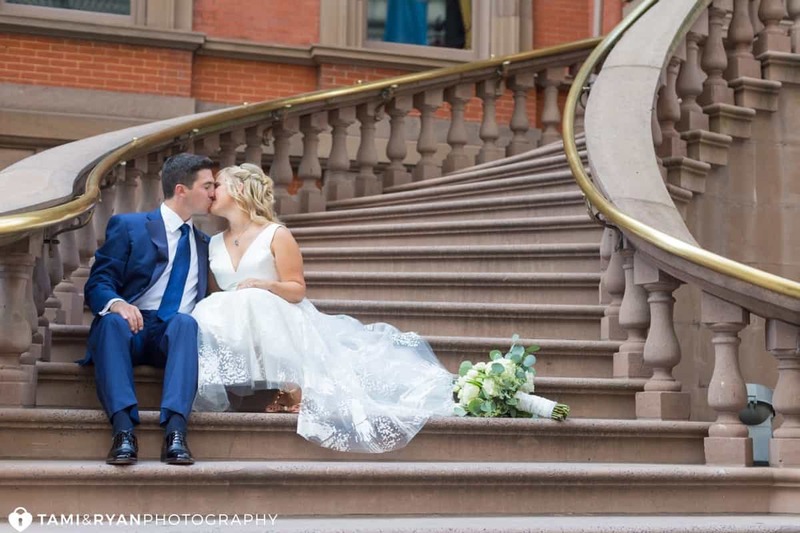 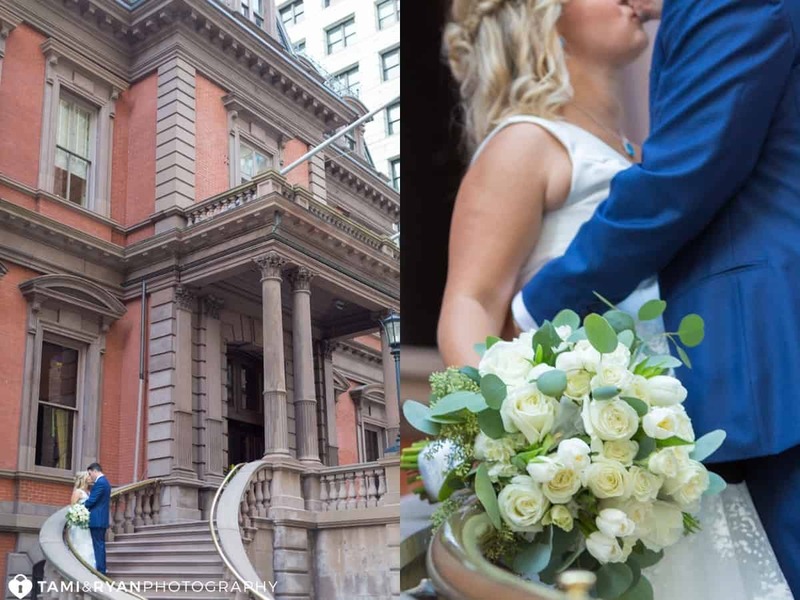 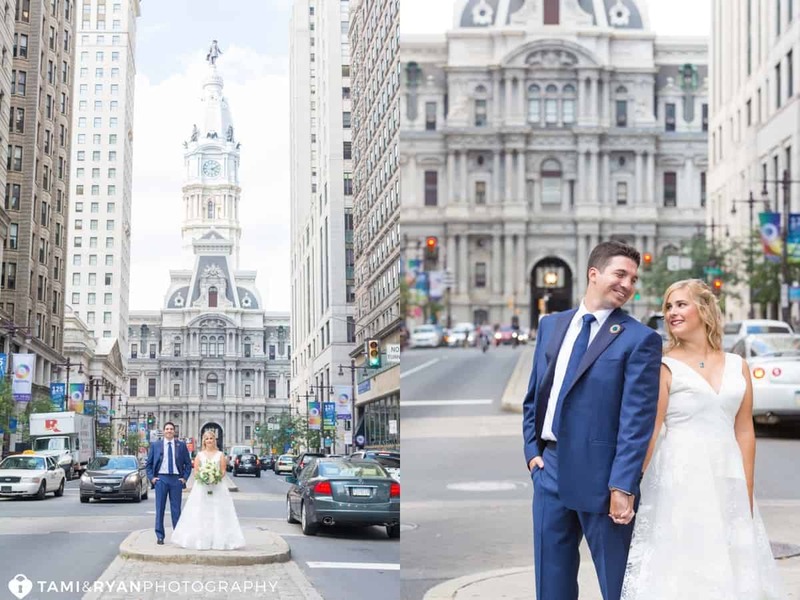 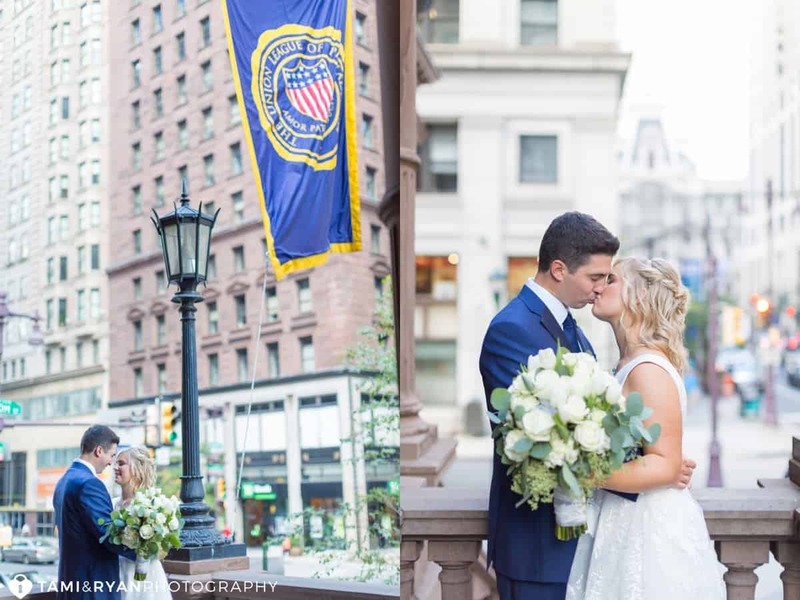 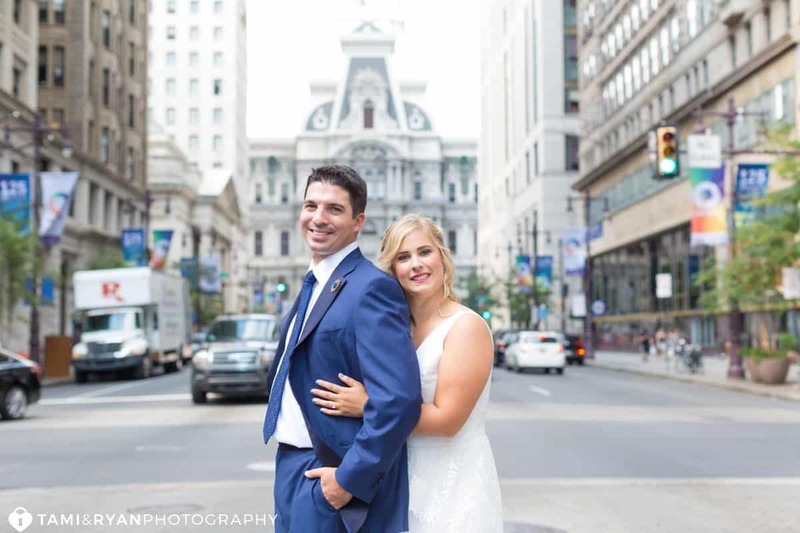 After their adorable First Look in the library, we took advantage of downtown Philly with portraits of the couple with classic Philadelphia in the background. 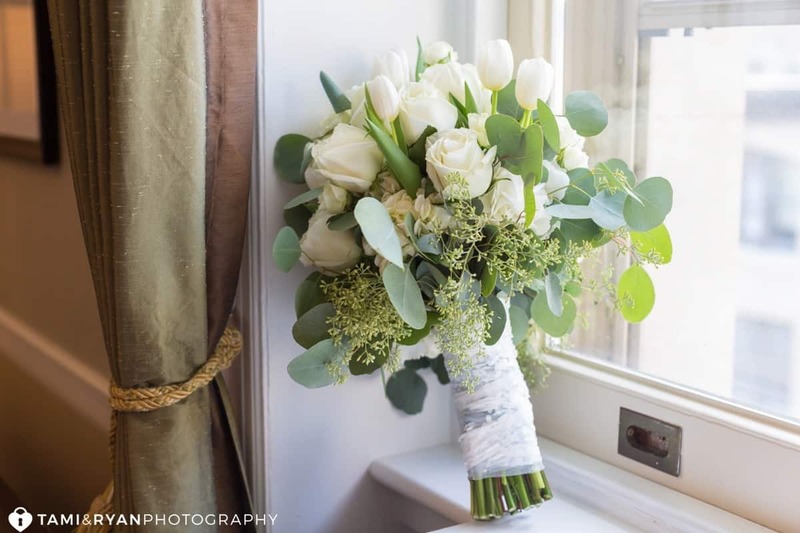 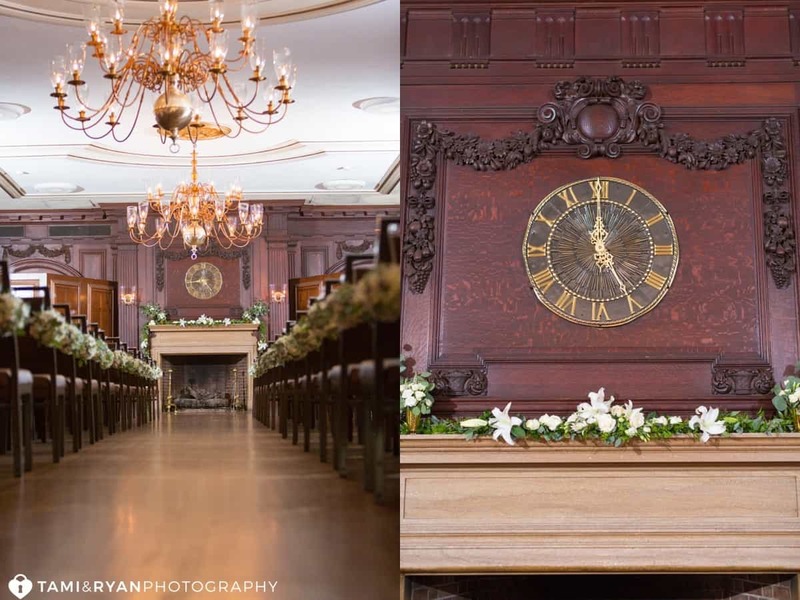 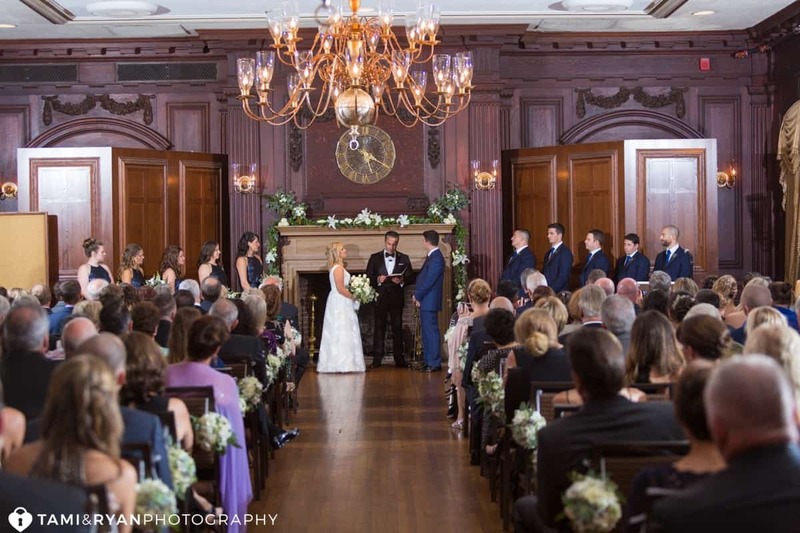 This classic, historic room only needed a few floral details to create a romantic wedding ceremony. 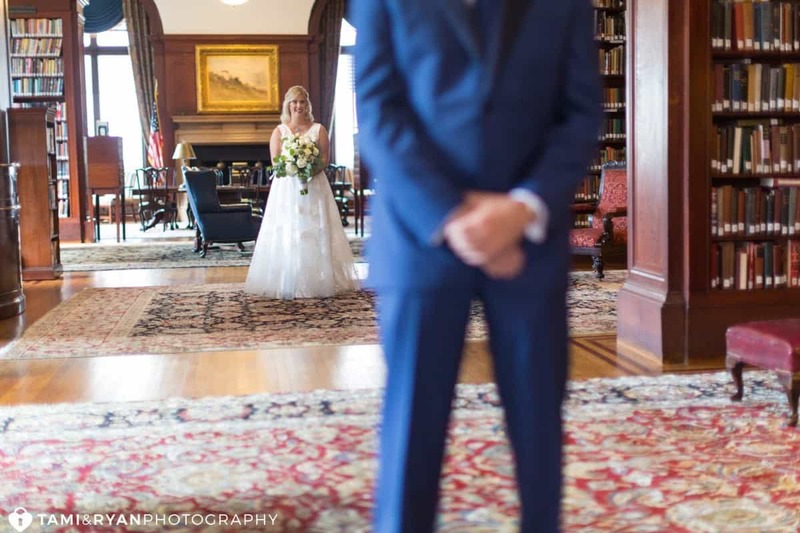 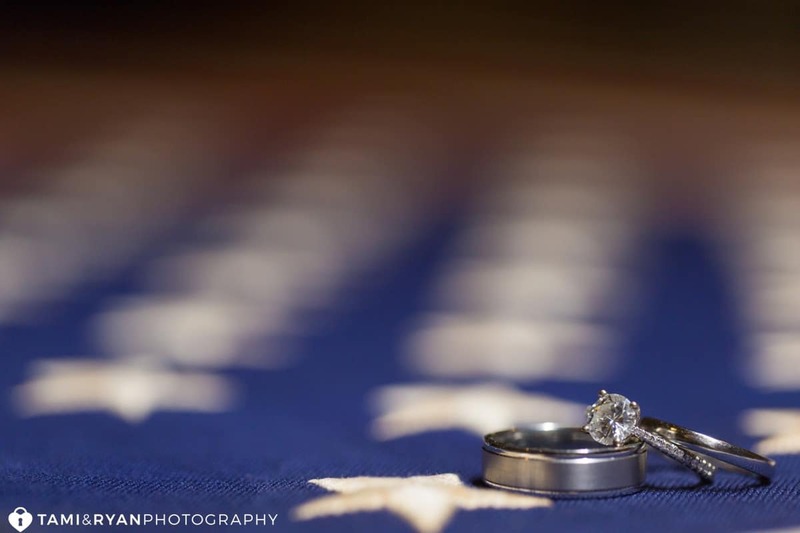 The bride and groom had clearly been anxiously awaiting this moment, but they still managed to plan meaningful details that involved their family. 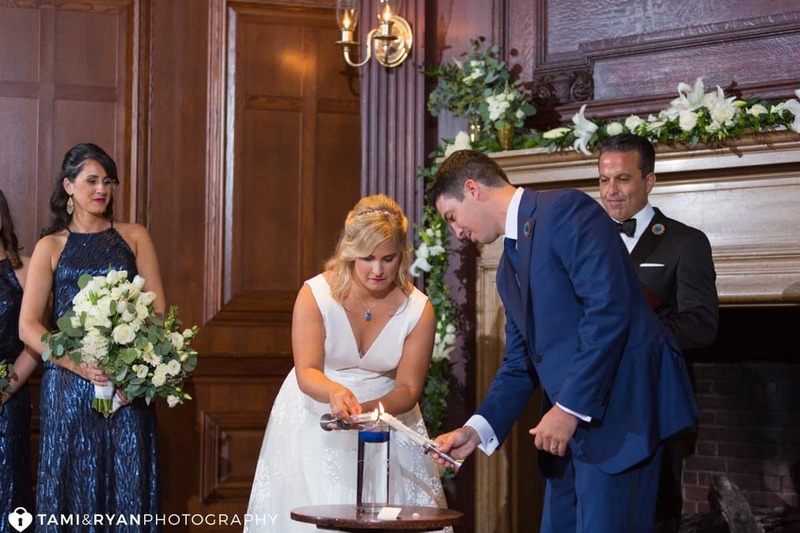 During the ceremony, the couple lit a unity candle using candlesticks made by the bride’s grandfather years ago when he worked in a steel mill in Pittsburgh. 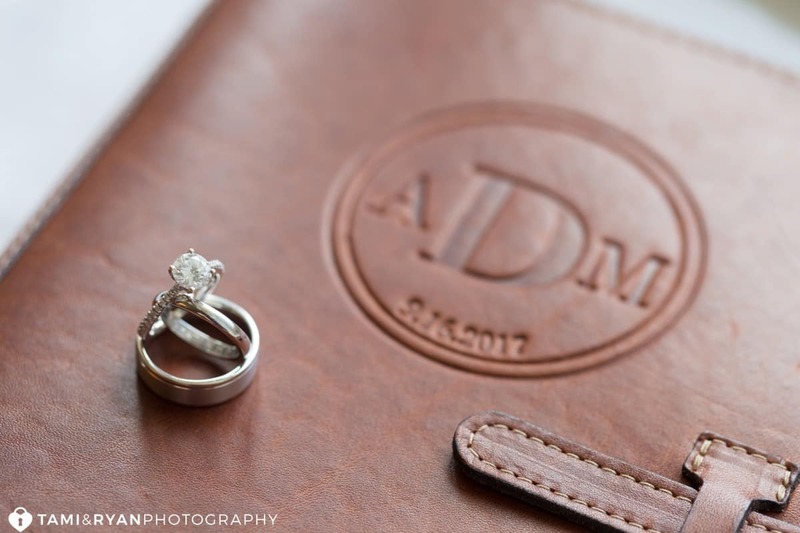 Loving how they included their family in their wedding plans! 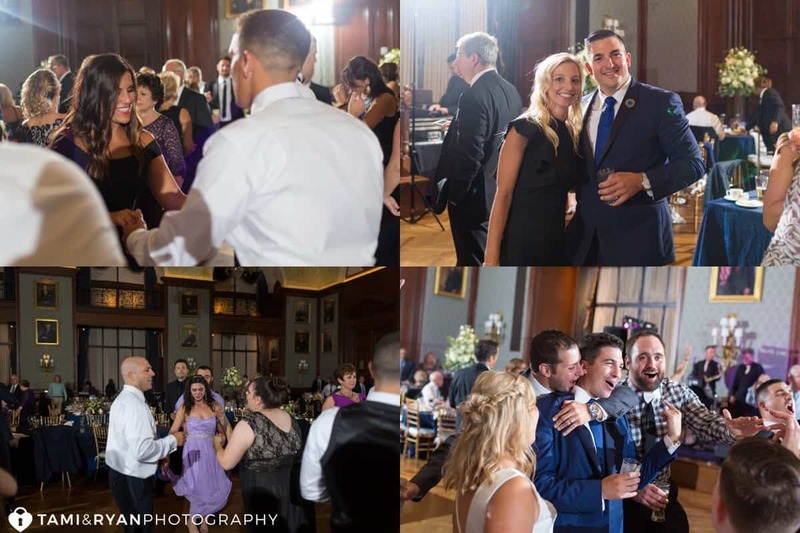 A Reception With All Their Family & Friends in the Grand Ballroom! 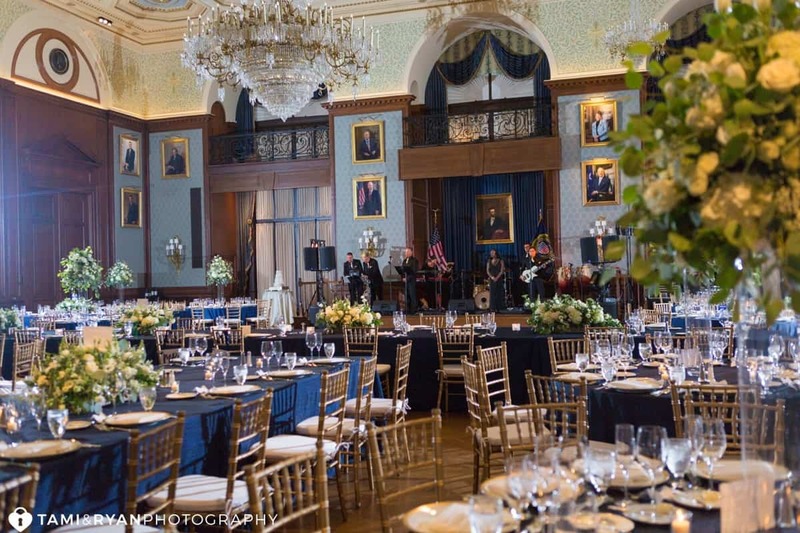 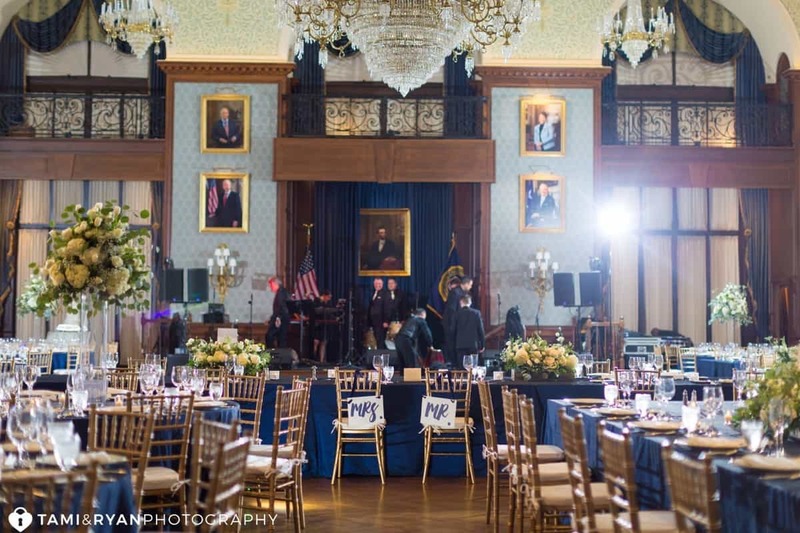 Lincoln Hall at Union League is an epic reception venue with glamorous details like the chandeliers and spectacular stage for the band. 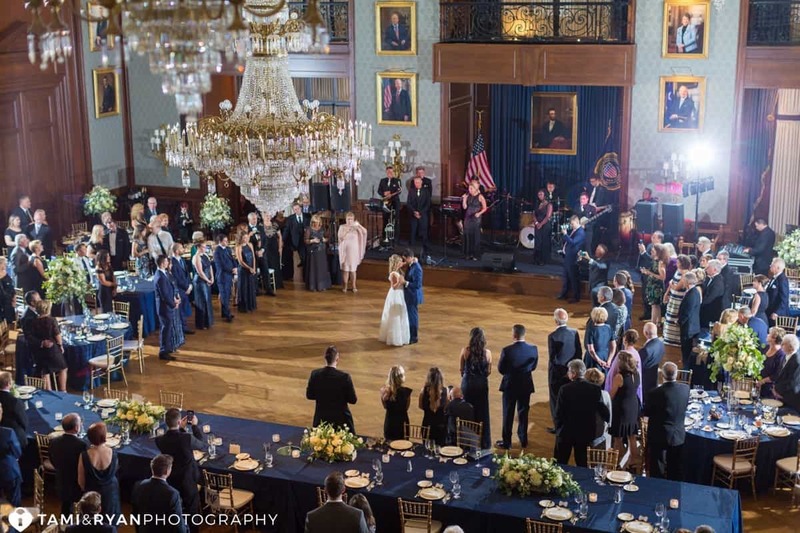 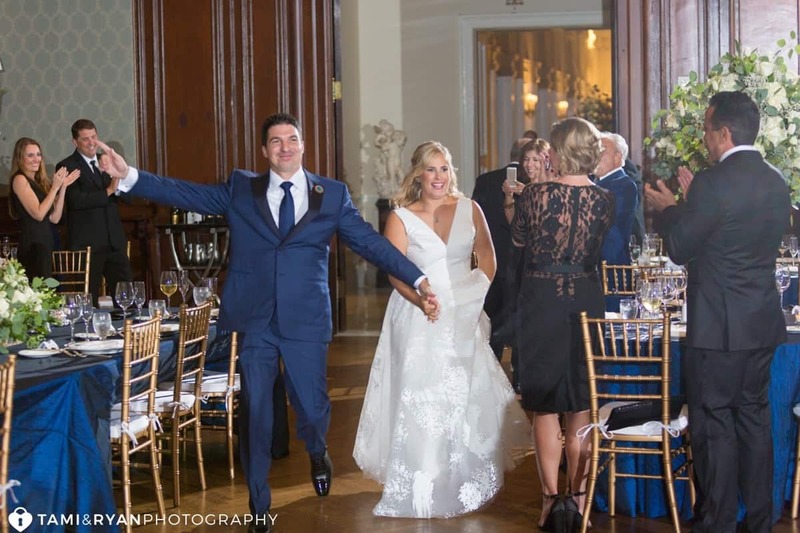 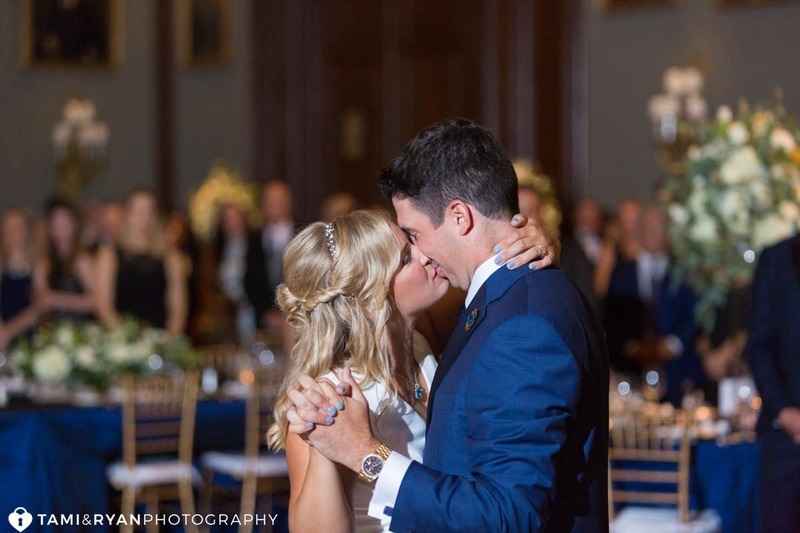 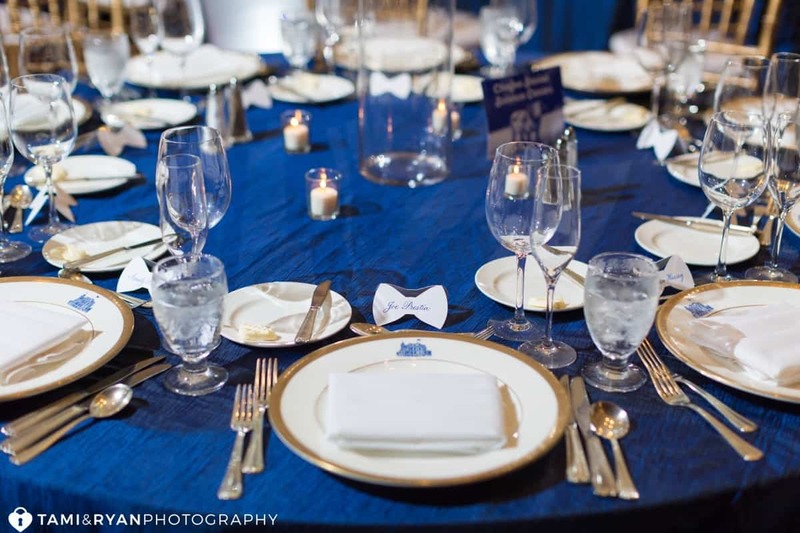 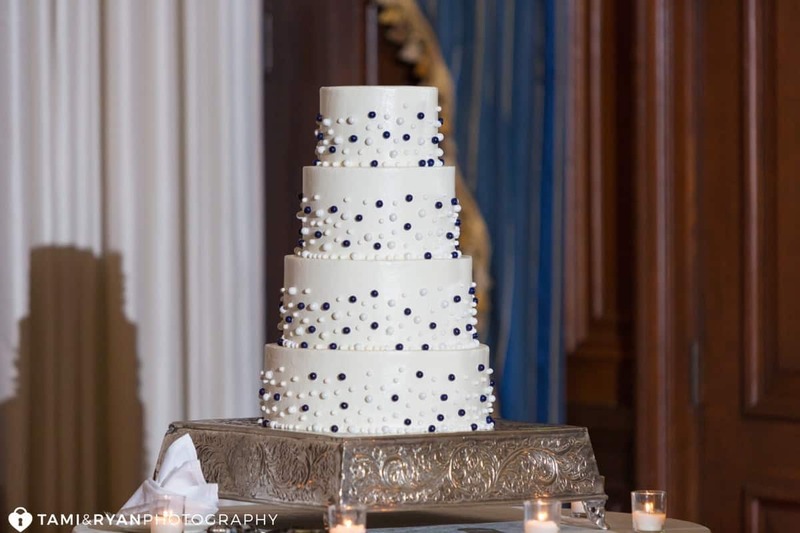 The navy blue tables, plentiful floral decor, and gold accents complemented the historic design of the room, adding to the classic, but chic wedding style. 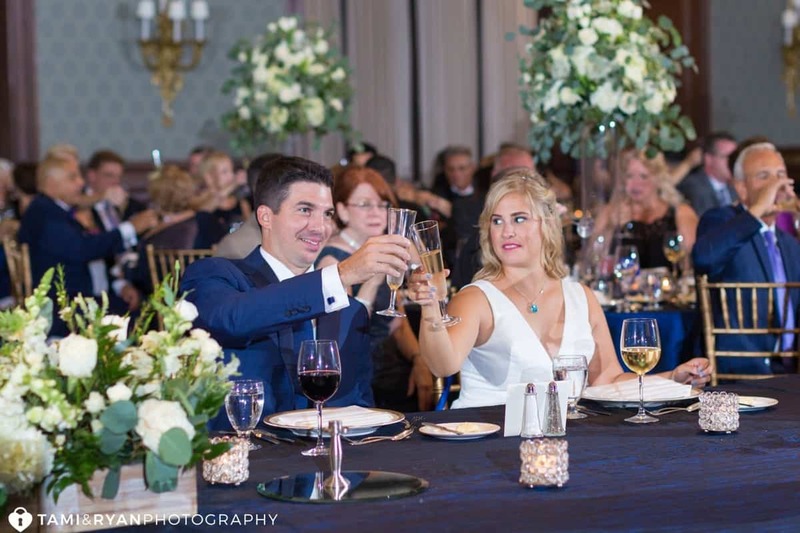 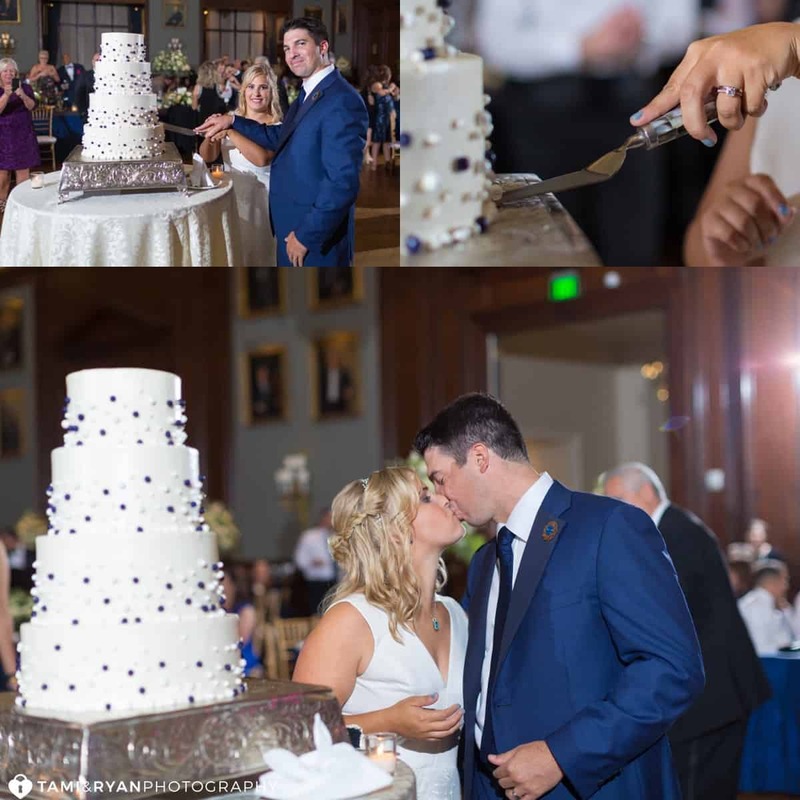 Mackenzie and Armand chose an amazing venue and created an unforgettable event for their family and friends. 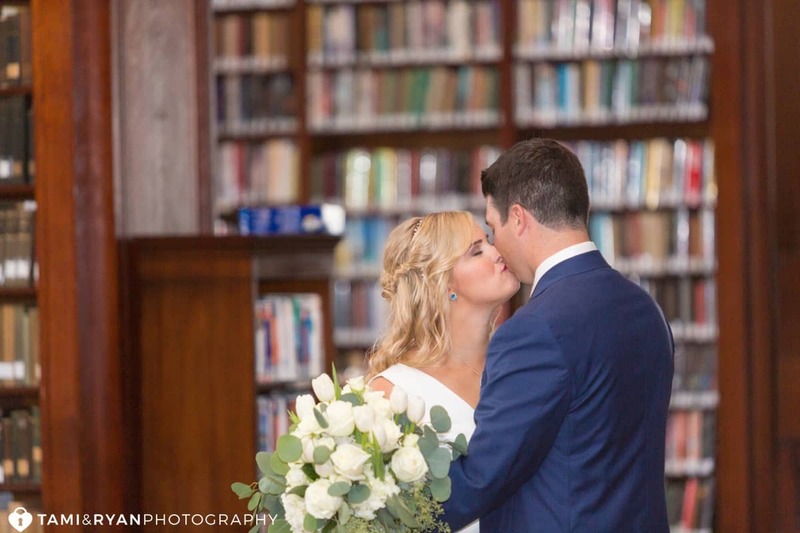 In lieu of wedding favors, the newlyweds made a donation to the American Cancer Society. 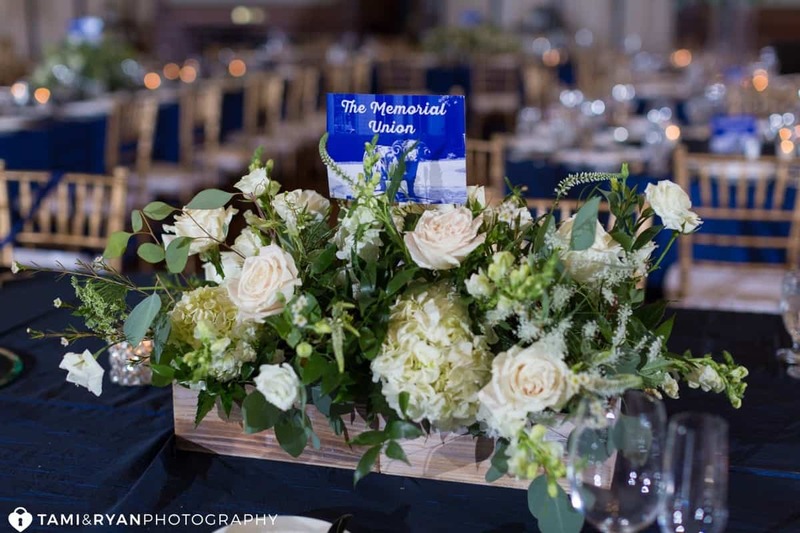 And after the wedding, all the floral arrangements were donated to the Abramson Cancer Center at the University of Pennsylvania. 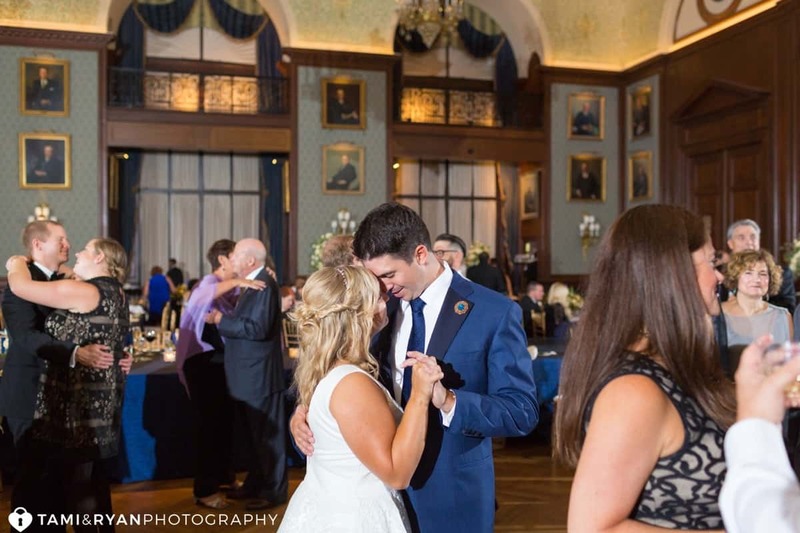 We’re so lucky to have beautiful couples like Mackenzie and Armand that have hearts of gold!